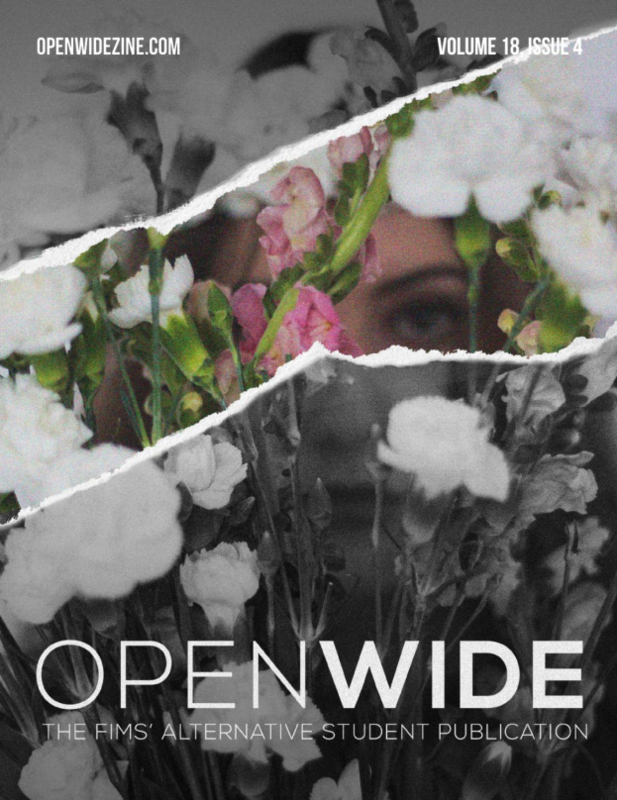 FIMSSC’s OpenWide prides itself on being an alternative student publication, providing a platform for academic discussion that any Western student, faculty, or staff can contribute to. It operates on a volunteer basis and is funded the FIMS Undergraduate Student Fund, where it must reapply for funding every three years. Articles are published in print and online, which allows for wide dissemination, and readers have the power to respond to content either through comment forums, or by submitting letter to the editors. When thinking about the publication’s label alternative media, you might wonder what this means, and what OpenWide is alternative to. In these post-truth times when Kellyanne Conway’s alternative facts proliferate like a cancer, you may be turned off by any media labelled “alternative” as a source of biased or fake news. So why should you or anyone consume alternative media? To explain why, it makes sense to first try to understand what it means when media are qualified as alternative. After all, as alternative media scholar John Downing argues, “everything, at some point, is alternative to something else”. Broadly, alternative media are media that can be distinguished from mainstream media–be they for-profit outlets like CTV and The Globe and Mail or public like the CBC–by their content, and methods of production or distribution. What most alternative media share, across an immense range of forms (newspapers and magazines, radio and video, zines, posters, graffiti, street theatre, and much more) and varied political views, is a dissatisfaction with what issues and topics are covered and how they are covered by mainstream media. That alternative media plays an important civic and critical role in society is evident when they cover stories that are otherwise not touched due to economic pressure from advertisers, or political pressure from owners and governments. I then decided to contact the largest and most popular newspaper, the New York Times. I called the public editor number on the New York Times website. The phone rang and was answered by a machine… I left a message stating I had access to information about Iraq and Afghanistan that I believed was very important. However, despite leaving my Skype phone number and personal email address, I never received a reply from the New York Times. It was then that Manning had to turn to alternative media, releasing to Wikileaks a trove of documents that has come to be known as the Afghan and Iraq War Logs, and the video “Collateral Murder.” These leaks are just one example, out of many others, of news stories the mainstream media refuse to break or will only pay attention to after coverage by alternative media. If you are interested in reading more stories that didn’t make the mainstream news, I recommend Project Censored, an alternative media research and advocacy organization that exposes and opposes censorship, and encourage critical media literacy. But even when the mainstream media does cover a particular issue, cultural group, or social movements, how these are represented may be superficial or heavily biased towards the status quo. Often, but not always, the voices that are regularly heard and taken seriously in the mainstream media are the already powerful: politicians, police officers, CEOs, employers, the wealthy etc. The points of view of, for example, marginalized groups like the homeless or the differently abled, protesters and strikers, and in general, the less-powerful working poor, may not be asked to give their side of a story, or, when they are, their views may not be taken as seriously as those promoting the status quo. Take, for example, how protests are covered. Instead of the issues that mobilized people, the focus is often on anything that may resemble violence and property damage. For instance, in mainstream photographic coverage of the protests in D.C. following the inauguration of President Donald Trump, why were burning trash cans a dominant motif? In some cases, misrepresentation translates into demonization. For example, after natural disasters (e.g. 2005’s Hurricane Katrina) people have to find food, water, medicine, and fuel for survival by taking from stores, but whereas white people are represented as “finding” supplies, black people are “looting.” Alternative journalists seek to remedy such imbalances in power by challenging the professional code of objectivity as nothing but bias towards the powerful and, therefore, give voice to the voiceless and deliberately take a side on a particular issue. In many cases, marginalized groups and activists feel like they have no choice but to make their own media and become citizen journalists for their experiences, communities, and political beliefs to be represented accurately or even at all. The need for alternative media is especially important because of the growing concentration of mass media into just a few hands. In Canada, over seventy percent of all media (including telecommunications) are owned by just six companies, and in the United States ninety percent of media are owned by six companies (in the 1980s, the same percentage was owned by fifty companies). These corporations are loyal to their shareholders and advertisers; profit-making is their primary motive and as a result, treat their audience as consumers and not citizens to be informed. As with Rupert Murdoch’s News Corps and the Sinclair Broadcast Group (US), companies impose their, in this case, conservative political ideals and cherry-picked news onto their audience as a unified voice over several different media. Effectively, massive conglomerations have the political power to give social reality a biased definition. For example, reports of crime do not match the actual rate of crime, which leads citizens to believe that crime is a bigger problem than it really is. It is likewise with terrorism. The political consequences of such a definition of reality may mean law enforcement receives disproportionate funding compared to, say, services for the mental health of citizens, or that we become more willing to trade off civil liberties for an appearance of security. Consequently, alternative media should and must confront the power of media conglomerates because, as alternative media scholar Nick Couldry argues: “To contest media power is to contest the way social reality itself is defined or named.” An example of this confrontation is the alternative media practice of culture jamming, which occurs when mainstream narratives, such as advertising and branding, and capitalist and political propaganda, is subverted by citizens with alternative messaging. An example of this is Robin Bell’s projection of the term ‘Shithole’ and the phrase ‘This place is a shithole’ onto the entrance of the Trump International Hotel in Washington, D.C., as a response to Trump calling El Salvador, Africa nations, and Haiti “shithole countries”. This took Trump’s racist assertion and literally projected it back onto Trump himself, publicly changing the messaging of and challenging what he said. Alternative media must step in when the mainstream media does not do their job, whether it’s not covering stories, taking the side of the rich and powerful, or not telling the truth. I am not, however, saying that all alternative media are good and all mainstream media are bad. Far from it. Both alternative and mainstream media share in the blame for the proliferation of fake and junk news. But the best of alternative media today arguably does what the mainstream media did when they first started centuries ago; they started out being critical of and an alternative to the church and the aristocracy’s dominance, challenging divine rule and institutional clergy, and their monopolies of knowledge. This emerging free press addressed their readers as being capable of evaluating claims and facts for themselves and, therefore, both opened up and validated secular and individual paths to knowledge. But this critical stance eroded throughout the twentieth century, with advertising being one of the main causes. The 1980s, however, was the watershed. Since that neoliberal decade, mass media ownership was concentrated into fewer hands, and many journalists were laid off or had to produce much more news in less time, impacting the type and quality of news that is produced and distributed. I want to stress that I am not arguing that you should only consume alternative media. Far from it. The “alternative” in alternative media should not be understood to mean that they are “instead of” mainstream media (both left and right) and that you should only get your news, analysis, and opinion from alternative sources. Rather, alternative should be taken as meaning “in addition to” the mainstream media. Having a one-sided diet is never healthy. Reliance on only one medium, consuming media from just one side of the political spectrum or getting your news only from your social media filter bubble is a problem. Alternative media is nothing to be feared, but is something you should consume as part of a diverse and, therefore, healthy media diet. And of course, whether we are talking about mainstream or alternative media, you should always be critical and check facts. 09/12/2018 in FIMS, Guest Speaker.